How to choose your Perfect Wedding DJ or Singer in Marbella? At the end of your big day, few things are as essential to the wedding experience as the Music, if your wedding DJ doesn’t measure up, it can completely change your guests opinion of the wedding. it is immensely important to get the evening entertainment spot on. The route most people to go down is the wedding DJ, although a singer or a live band are two good options, and remember don’t hire your uncle if you want a professional wedding music service. You have a wonderful reception booked at a beautiful venue, you’ve hired professionals to look after your photography, videography, but you have a relative DJ’ing your wedding? This is a common wedding mistake that many couples make when planning their wedding. How do I find my perfect DJ for my wedding? How much will a good wedding Dj cost? How much should we budget for a wedding DJ in Marbella? What sound equipment does he/she utilize? What Should A Wedding DJ Provide? Do you want a DJ that will create an all-night dance party with everybody’s favorite hits o do you prefer a singer or a live band with a close list of songs? Or maybe you’re looking for a wedding DJ who can play more obscure songs that you and your spouse love? How to choose the perfect Wedding DJ or Singer in Marbella? It all starts by knowing what you’re looking for on your wedding day. There are many superb, very well equipped, English wedding Dj’s, singer or band in Marbella, you should have a choice of top DJs that fit your style and personality, and have the proper experience and skill for your wedding. 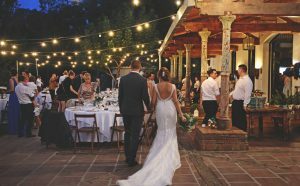 Our free wedding advisor (Marbella Weddings) will help you to choose your best wedding DJ in Marbella area (Costa del Sol), your best singer or live band wedding in Marbella. Weddings have special needs and the Singer or Dj will most often need to provide the audio and lighting for the show, maybe microphones for speeches, or even the audio for other parts of the day. Your wedding DJ, Singer or Band will be able to advise you on what works when it comes to party music. There are plenty of good Djs and Singers in Marbella area, but it may take some time to find the perfect one for your wedding. We are sure there is a good wedding DJ or Singer in Marbella that will have the same tastes as you (or at least close to it!). Word of mouth and recommendations are a good start but music is so personal that we recoomend to take a look through our list of top wedding DJs in Marbella. Many wedding venues in Marbella also provides a list of recommended wedding DJ’s or they works with a specific Dj, we always suggest meeting with several wedding DJ’s that come highly recommended from sources you know and trust. When you make internet research, be aware that the top page listings are paid for or SEO agent paid, so the names that pop up first, aren’t necessarily the best wedding DJs. How much should we budget for a wedding DJ in Marbella? How much will a good wedding Dj cost? If you’ve started to look for your wedding DJ, you may have noticed a huge variety in prices. There are a lot of factors that go into the price of a professional wedding DJ, but you can get a really good and experienced wedding DJ in the mid range of prices and expect a solid backup plan, customization, and professional service. Some DJ’s charge whatever they want for an event and all too often take advantage of a person with limited knowledge on the what it should actually cost. Price depend mainly on reputation and duration, but a worth top singer or DJ for 4 hour reception would be between 500-1.500 €, also you have to expect to pay for travel if your DJ isn’t local to the venue. Also you can find a local and good live band over that price. But what makes a great wedding DJ? A great wedding Dj in Marbella and all over the world will set the scene and maintain the right tempo throughout the reception to ensure you and your guests are thoroughly entertained and make the evening just as memorable as the day deserve. A professional DJ is able to play your favourite songs as well as set the mood for your first dance, A top Dj will add a real boost to your reception. We have a list of the top wedding DJs in Marbella perfect for your wedding day. Do start looking early? When to Book A Wedding DJ and How? It is particularly prudent to get your booking in early if you are considering booking a top DJ. The likes of Fearne Cotton, Scott Mills and Simon Webbe are always in high demand so if you have your heart set on one of these star names then get in touch asap! Any DJ worth the cost he lists, is booked well in advance. To guarantee a professional DJ you want on your wedding you need to book as far in advance as possible. Ultimately, the wedding is about YOU. Which wedding DJ, singer o live band has YOUR best interest in mind? Do not let picking a wedding DJ overwhelm you. Very interesting article, it is so important that the DJ was great for a good wedding!